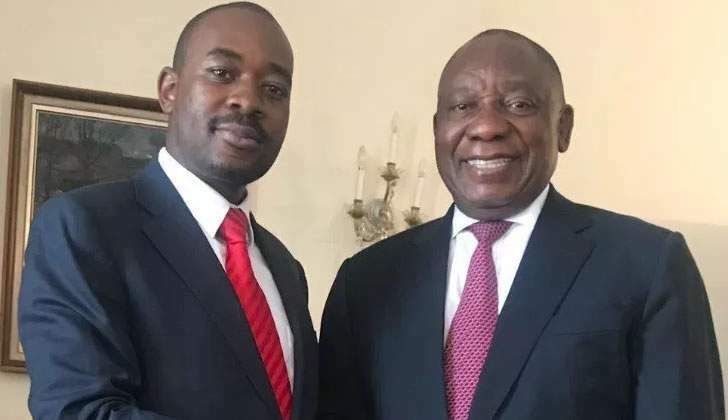 "A few days ago I had a fruitful meeting in Pretoria with my distinguished brother and fountain of wisdom the president of the republic of South Africa His Excellency Cyril Ramaphosa on a wide range of urgent and important issues regarding the well being of the people of Zim," tweeted Chamisa. Flattery, flattery! President Ramaphosa, a "fountain of wisdom" even he must have blushed at the clumsy attempt to flatter him! SA and the rest of SADC nations were warned by Kofi Annan and his group of elders of the need to resolve Zimbabwe's unending political crisis. Sadly the regional grouping has failed to take decisive action. The Zanu PF dictatorship, at the very heart of the crisis, has been allowed to continue thrive. Zanu PF rigged the 2013 elections and rewarded with absolute power. Instead of party then addressing the nation's worsening economic situation the party has been engrossed in its internal factional fighting. The factional war climaxed in the firing of then VP Mnangagwa who took his revenge by staging the November 2017 military coup to ouster Robert Mugabe a few senior leaders. SADC leaders said nothing to show their displeasure. To win over SADC leaders' support following the coup, Mnangagwa promised to hold free, fair and credible elections. SADC leaders should have stepped up their demands for Zimbabwe to implement the democratic reforms designed to stop Zanu PF rigging elections. They did not. Mnangagwa went on to blatantly rig the 30 July 2018 elections. The SADC election monitoring team's report concentrated on how peaceful the election period had been as if that was all they dared to look at. Other election teams did notice that the whole process was flawed and illegal and thus condemned the elections. Rigging the elections was the easy bit for Zanu PF, rigging economic recovery has proven a bridge too far. Before the rigged elections Zimbabwe's unemployment level was already a nauseating 90%, basic services such as supply of clean water and health care had all but collapsed, etc. By rigging the elections Zanu PF confirmed that Zimbabwe was still a pariah state ruled by corrupt and vote rigging thugs. This killed off all hope of meaningful economic recovery as no investors, local and foreign, likes to do business in a pariah state. The economic consequences of rigging the elections were felt immediately as the country was hit by shortages of cash, foreign currency, fuel, food, etc.. The worsening economic situations is causing heart-breaking economic hardships making Zimbabwe socially and politically unstable. It is the human suffering and the instability everyone including SADC leaders is now worried about. If SADC leaders had taken decisive action to ensure Zimbabwe had free, fair and credible elections; there would be nothing for everyone to worry about in Zimbabwe. "The economic and political crisis in Zimbabwe is worsening and what is important is that this affects our neighbouring countries, particularly South Africa. We feel that Zimbabwe is becoming a regional security threat because of the failure by Mnangagwa's government to solve the political stalemate over his illegitimacy," explained Jacob Mafume, MDC Alliance party spokesperson. "The economic crisis has the effect of causing a burden to South Africa owing to the exodus of people that are fleeing the worsening economy. Mnangagwa has refused to listen to our concerns, so we felt it was better for us to meet President Ramaphosa to listen to our concerns and also to relay our message to Mnangagwa. "The people of Zimbabwe continue to suffer, and as a party that was voted for by millions of people we will do what we can to offer solutions." One does not need to be a "fountain of wisdom" to know that it was MDC leaders' failure to implement even one meaningful democratic reform during the 2008 to 2013 GNU that has led to this mess. SADC leaders have warned MDC leaders not to take part in the elections without first implementing the reforms but were ignored. One only hopes that President Ramaphosa will now appreciate the seriousness of Zimbabwe's economic meltdown and, together with his fellow SADC leaders, finally take decisive actions to end the Zimbabwe crisis before it is too late. We, the people of Zimbabwe, now admit that it was a foolish thing to have allowed Zanu PF to rig elections and then to get away with it. We have paid dearly for it and have resolved never to make the same mistake ever again. There is overwhelming evidence to show Zanu PF blatantly rigged the recent elections. Instead of rewarding the party as before, we are demanding that the party must step down. The recent elections were flawed and illegal and would have never taken place if MDC leaders had implement the democratic reforms when they had the golden opportunities to do so. We are not going to reward MDC leaders for betraying the nation. We demand that Chamisa and his friends step aside. To end the political crisis and the the curse of rigged elections we propose the appointment of an interim administration tasked to implement the democratic reforms and to hold the country's first ever free, fair and credible elections. We would like SADC leaders to help us make this happen.